Gloves may not get quite as much attention as your other winter clothing, but they offer invaluable warmth and protection when the temperature drops. Our picks for the best winter gloves of 2018-2019 below span the spectrum from high-performance models for extreme conditions to functional pieces for everyday use and work (our favorites blur these category lines). Many of the gloves are unisex and come in a range of sizes, but we've also included a link to the women's-specific version when available. For more background information, see our winter glove comparison table and buying advice below the picks. To complete your cold-weather kit, see our articles about the best winter boots and winter jackets. What we like: Bombproof construction and sharp looks. What we don’t: Slightly less dexterity than the Hestra Fall Line below. Give’r is a relatively young company, but they’ve quickly made a name for themselves with their feature set, build quality, and distinctive styling. 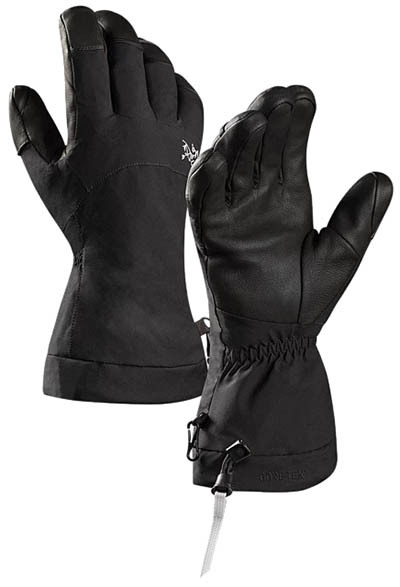 Their 4-season model is the whole package in a winter glove: you get premium leather construction, a fully waterproof design (we verified that they even keep your hands protected in boiling water), and warm Thinsulate synthetic fill. For everything from everyday outdoor use to resort and backcountry skiing, the Give’r is a great choice. One of the main downsides of the 4-Season Give’r Gloves is the $99 price tag (with wax coating and branded initials on the Give’r website, you’re looking at $114). And realistically, the glove is a small step down in feel and dexterity from the Hestra below. But unlike the Fall Line, the 4-Season comes with a waterproof membrane and undercuts it in price by a significant margin ($56, to be exact). We did find that the unisex sizing is a bit strange, but otherwise there’s little to complain about. All in all, these are awesome gloves for a variety of uses. What we like: Impressively versatile. What we don’t: Not as tough as the Give'r above. Many winter gloves are made with a specific purpose in mind, whether it be skiing, outdoor work, or casual use around town. The Smartwool Ridgeway glove—with cozy merino insulation, a tough leather exterior, and a great fit—blurs these lines better than most. 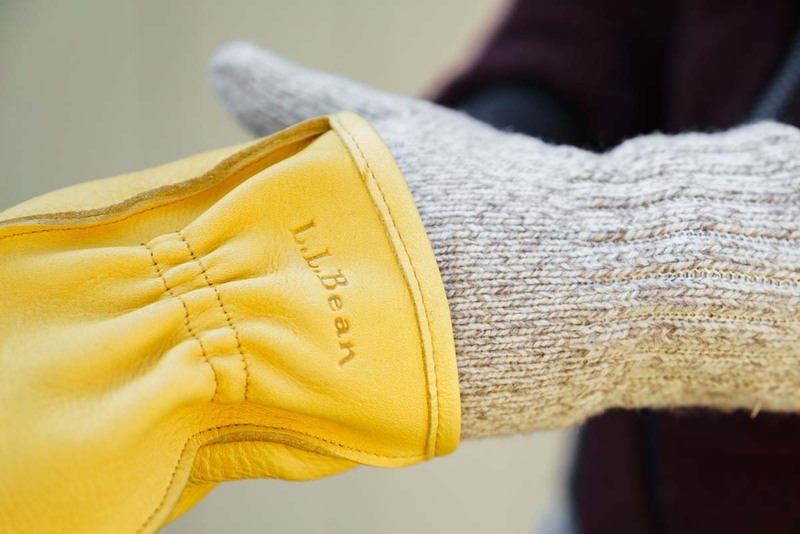 Subtle branding and classy looks make it a popular choice for urban use, but the glove is warm and durable enough for the occasional day on the slopes. Further, the Ridgeway’s reinforced thumb and index finger add durability for light work tasks. What are the downsides with the Smartwool Ridgeway glove? As with any all-rounder, it’s not the top of its class performance- or durability-wise. There is a bit less dexterity in the fingers than we would like, and the glove lacks the waterproofing and windproofing of an option like the Give’r above. Moreover, the Ridgeway cannot compete with the toughness of a true work glove. But for a design that can be worn day in and day out, it’s more robust and weatherproof than most, making it our top pick for an everyday style. Size-wise, we found that the Ridgeway runs small, and a tight cuff can make it slightly difficult to get on and off. What we like: Solid performance at a low price. What we don’t: Bulkier and stiffer than more expensive options. Carhartt’s large lineup of gloves ranges from thin liners to burly camouflaged hunting models, and their popular WB glove lands right in the middle. It’s reasonably soft and moves well enough for casual activities, but with features like a waterproof membrane, nose wipe, and reinforced palm, the WB is a serviceable option for mild days on the slopes. Priced at $35, and often available for less on Amazon, the WB offers a lot of bang for your buck. What are the pitfalls of such an affordable glove? In temperatures below freezing, you’ll likely find that the WB’s thin layer of cheap synthetic insulation isn’t enough to keep your hands super warm. Furthermore, this glove lacks the versatility and good looks of more expensive all-rounders like the Hestra Fall Line below or Smartwool Ridgeway above, and the polyurethane palm doesn’t move as well as leather. But as a simple and affordable option, the Carhartt WB is one of our favorites. What we like: Super warm and well built. What we don’t: Overkill for all but the coldest winter conditions. 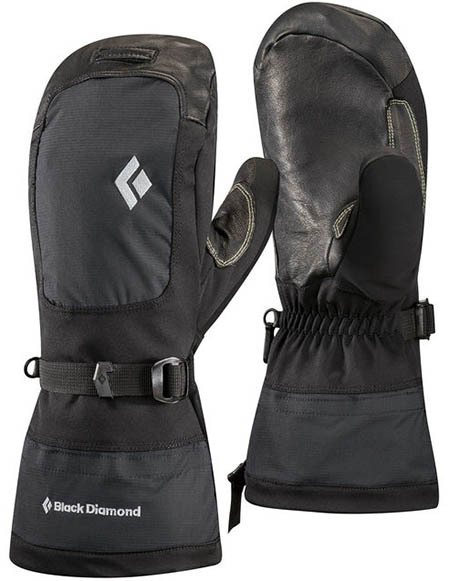 For the ultimate in winter warmth, check out the Mercury Mitt from Black Diamond. Simply put, it’s designed to keep your hands toasty in some of the coldest places on earth and does a pretty darn good job at it. You get thick PrimaLoft Gold insulation throughout along with a handy removable liner that makes these mittens more tolerable is less-than-Arctic conditions. And we like the split-finger design on the inside, which allows your index finger to roam free for better movement. Who should consider buying the BD Mercury Mitt? It’s made with alpinists in mind, but it’s also a great everyday/commuting mitten in frigid places like Chicago, Minneapolis, and the East Coast of the United States. In particular, this mitten makes a lot of sense for people who run cold and just can’t get enough warmth. And at about $50 cheaper than the Outdoor Research Alti below, the Mercury Mitt is a good value to boot. What we like: A well-appointed fleece glove at a good price. What we don’t: Fleece isn’t great in wind, rain, or snow. The North Face’s Denali Etip is your classic fleece glove—cozy, dexterous, and moisture-wicking—but with a few extra features. It includes touchscreen compatibility on all five fingers (although we can’t think of the last time we used our pinky on our phone’s screen), along with a reinforced panel of nylon along the back of the hand for toughness and light weather protection. Along with its comfortable, articulated shape and high-grip palm, the Denali Etip checks the boxes for a simple, everyday fleece glove. Despite its thoughtful feature set, the Denali Etip has its limitations. Most importantly, you won’t get the water or wind resistance that a similar weight synthetic glove like the Black Diamond Midweight Softshell below offers. But for what it is—a comfy $30 design for around town use—the Etip is pretty darn good. It even has a tab at the cuff to make it easy to take on and off. Keep in mind that the Denali is made with middle-of-the-road 300-weight fleece, but The North Face’s extensive lineup also includes a lighter 100-weight version as well as a Hardface model for better wind resistance. What we like: Premium build quality and dexterity. What we don’t: Expensive and not waterproof. Hestra gloves are kind of like a work of art. The Swedish company has a long track record of craftsmanship, and their Fall Line glove is our favorite everyday model. This all-leather glove nails the essentials: it’s comfortable, well built, and tough. Importantly, the Fall Line also is highly versatile: it offers sufficient insulation and cushioning on the back of the hand for most winter sports (it earned a spot in our article on the best ski gloves), but is dexterous enough to use while driving, shoveling, and simply walking around town. And the Fall Line is made to last—our well-worn pair has softened and conformed to our hand, giving it a custom feel that still looks and performs like new. The biggest downside of the Fall Line is its steep $155 price. You’re paying for quality and the feel is phenomenal, but this is a hearty investment for a glove you won’t wear on the coldest days (if we’re inactive, we’ve found that it’s only warm enough down to about 20°F). It’s also not fully waterproof, although occasionally treating the leather will keep it from soaking up too much moisture. All in all, the Give’r glove above arguably is a better value, but the Hestra’s premium look is something we appreciate each and every time we slip them on. What we like: Buckskin leather and Shetland wool: as classic as it gets. What we don’t: You’ll have to waterproof them yourself. Nothing spells classic quite like a leather chopper mitt, and the Buckskin Chopper from Maine-based L.L. Bean is as ageless as they come. On the exterior, wind-resistant deerskin leather is nicely constructed with exposed seams. On the inside, there’s a layer of Shetland wool along with a removable and cozy wool/nylon liner. For a mitten style, the Chopper also is reasonably dexterous: the glove flexes quite a bit to provide decent grip around a shovel or hand rail. What are the downsides of the L.L. Bean Chopper Mitts? Unlike the 4-Season Give’r above, they do not have a waterproof membrane, and therefore the leather requires a wax or DWR treatment to keep moisture out. But it’s made to last—there’s even an extra “wing” of buckskin on the crook between the thumb and index finger for durability. For a traditional look around town or for those who don’t mind chopping wood or shoveling snow in a mitten, the Buckskin Chopper is a great option for cold and dry conditions. What we like: Very warm and waterproof. What we don’t: Heavy insulation results in limited range of movement. Outdoor Research’s popular Alti, touted as an expedition glove for the harshest of environments, is a performance design through and through. Simply put, this glove is very warm, waterproof, and protective. Its Gore-Tex membrane, burly nylon fabric, and PrimaLoft insulation in both the outer shell and inner liner make it a great choice for bitterly cold and wet conditions. And the Alti comes with a number of features ideal for high-mountain endeavors, including a removable leash, high-grip palm, and extended gauntlet design. We wore the Alti’s through a season of ice climbing and backcountry skiing, and our only real complaint was regarding dexterity. We were still able to clip ice screws and get a solid hold on our ski poles, but the heavy insulation and removable liner do have a noticeable impact on fine motor movements. The glove is also overkill for high-output activities on all but the most frigid days. That being said, the glove and mitten versions of the Alti are common choices for skiers and other outdoor adventurers who are prone to running very cold. Keep in mind that fit may be an issue as these gloves tend to run small and tight. What we like: Dexterous but still warm and durable. What we don’t: The tight cuff makes it difficult to put on. Softshell gloves’ stretchy construction provides excellent dexterity, comfort, and breathability, making them a popular choice for anything from daily wear to serious backcountry pursuits. Among the myriad options, Black Diamond’s Midweight Softshell hits a nice middle ground for shoulder season endeavors or high-output activities during the colder months. 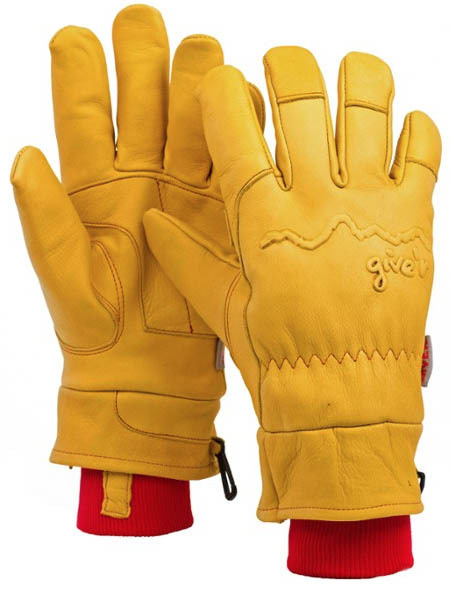 Its snug fit and goat leather palm make it easy to grip tools, and it’s reasonably warm with 60-gram insulation protecting the back of the hand. Further, the Midweight’s low-profile design and touchscreen functionality on the thumb and index finger are ideal for pulling double-duty as a warm liner glove. Our biggest gripe about Black Diamond’s Softshell glove is the cuff—we like the comfortable and warm neoprene/fleece mix, but it’s not as stretchy as we would like. The glove fits well once on, but pulling it on can be a battle. Additionally, the Midweight is not waterproof and may not be warm enough for some deep winter sports like mountaineering, yet it’s a bit too hot to wear while running. For those needs, we’d recommend checking out BD’s Heavyweight Waterproof and Lightweight Softshell gloves, respectively. What we like: Durability combined with warmth and comfort. What we don’t: Not as warm as the L.L. Bean Buckskin Chopper. 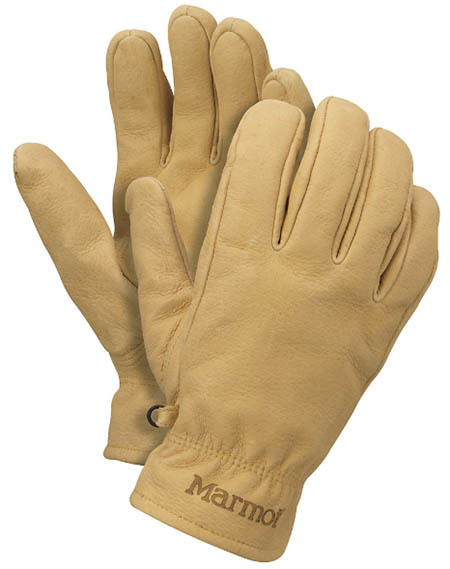 We like what Marmot has done with their Basic Work Glove. Appearance-wise, it’s a standard leather model that is durable, dexterous, and a good match for daily use, chopping wood, or trail maintenance. But on the inside, Marmot added a soft brushed tricot lining that provides warmth, moisture wicking, and comfort. 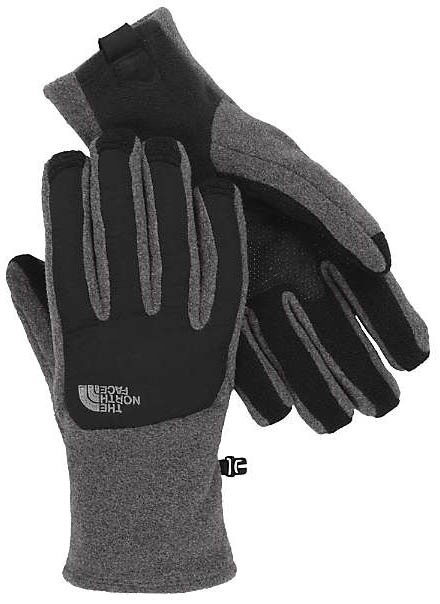 For winter or shoulder season outdoor work, this glove should get the job done. But the Basic Work Glove has more uses than that—we know many skiers and ice climbers who opt for this (or similar) design as an affordable alternative to the more technical models. In many ways, the Basic Work Glove is similar to L.L. Bean’s Buckskin Chopper above: you get the durability of leather combined with a warm inner lining. Choosing which model suits your needs will be a matter of personal preference. The Marmot is more of a performance piece with its superior range of movement, but you don’t get the same amount of warmth as with the L.L. Bean, or the removable liner. And similar to the Buckskin Chopper, you’ll have to add Sno-Seal or other treatment to the leather for full waterproofing. 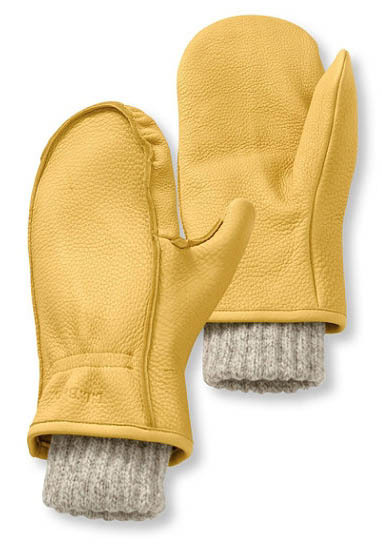 What we like: Soft and close-fitting for a wool glove. What we don’t: More expensive than the Denali Etip. There’s nothing particularly special about Outdoor Research’s Flurry Sensor Gloves—they’re not waterproof, they don’t keep you warm in sub-zero temperatures, and they’re not as durable as a leather glove. But for daily tasks like walking the dog, driving to work, or using your phone outside, a simple, high-quality glove like this may be all you need. And unlike many wool options that are prone to stretching over time, the Flurry Sensor maintains a close fit and soft feel. One of the Flurry Sensor’s closest competitors is the Denali Etip above. We’ve found the Denali is a little more dexterous and its touch-compatibility is more refined, but the OR’s tightly woven exterior and fleece liner is warmer and more wind and water resistant. For $10 less, we prefer The North Face design for quick trips outdoors, but the Flurry Sensors’ additional insulation makes it a popular choice as well. What we like: Waterproof, durable, and dexterous. What we don’t: Could extend further up the arm for more coverage. 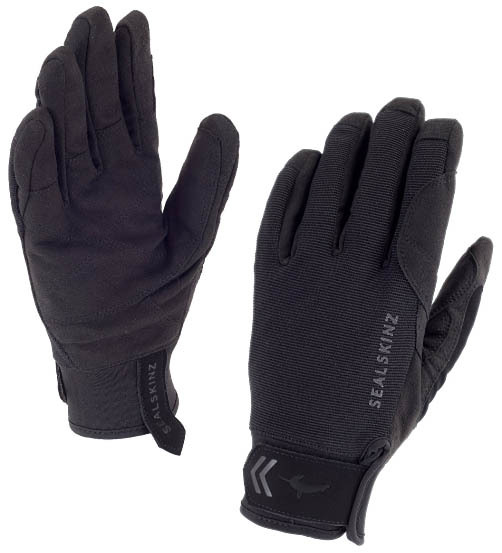 SealSkinz stands out in the winter glove market with their unique waterproof designs. And the Dragon Eye is arguably their best effort to date: it’s articulated for good movement, touchscreen compatible, and includes a suede palm for added grip and durability. 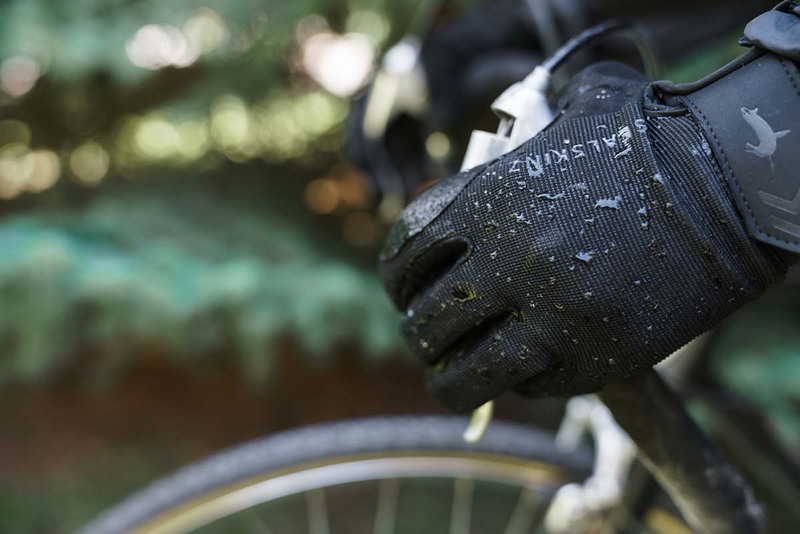 Bike commuters in particular like these gloves, and we think the Dragon Eye also works great for climbing, winter hiking, and other activities where you need waterproofing and minimal bulk. It’s important to note that the Dragon Eye is essentially a beefed-up liner glove and isn’t all that warm. This isn’t an issue for many high-output activities, but it can’t cross over into the ski world like the 4-Season Give’r above. Additionally, the waterproof protection means that it doesn’t breathe as well as a non-waterproof model, which can lead to sweaty hands while running. And our final gripe about the SealSkinz is the length: we wish the Dragon Eye extended a bit further up the wrist for more waterproof coverage while cycling. What we like: The best in materials and design. What we don’t: Not an incredibly warm glove; expensive. The Fission is a winter sports glove from Arc’teryx, made for everything from backcountry skiing and snowshoeing to ice climbing. And as we’ve come to expect from the B.C. brand, the Fission is well designed and made with top-quality materials. The softshell exterior is stretchy and tough, and the mix of 100-gram PrimaLoft around the palm with thicker 133-gram fill on the back of the hand balances warmth with hand feel while gripping a tool or ski pole. Its Gore-Tex insert, leather palm, and full-coverage gauntlet round out the Fission’s full-on performance build. Why is this premium offering from Arc’teryx towards the bottom of our list? In most situations, it’s overkill in both price and features. 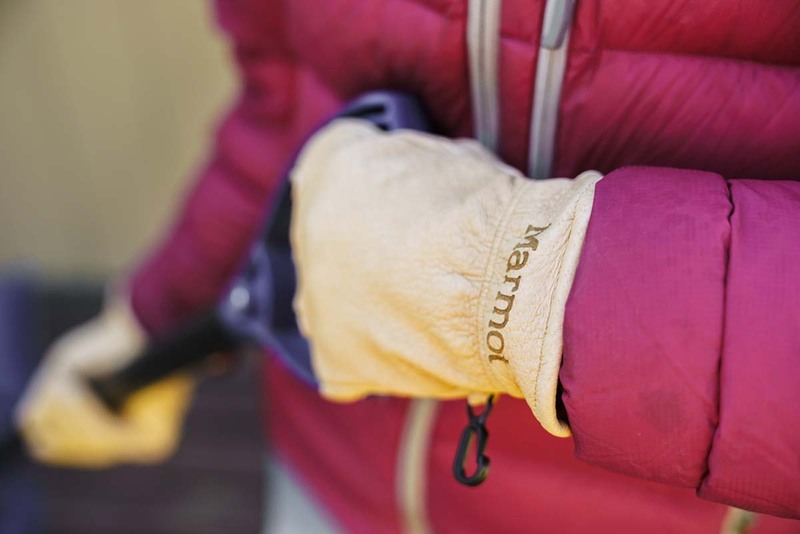 Most of the time you can get away with a much more affordable glove—we know several seasoned ice climbers who opt for a design like the Marmot Basic Work Glove over the Fission. Furthermore, it’s not meant for extreme cold—with double layers of insulation, OR’s Alti above is much warmer and $30 less (but with a notable drop in dexterity). All that said, the Fission delivers typical Arc’teryx craftsmanship and high-end performance for the most discerning outdoor enthusiasts. What we like: A casual option that’s still quite warm. What we don’t: Fuzzy shell will soak up water if exposed. Gordini has been a mainstay in the ski world for decades, offering a comprehensive lineup of affordable gloves to keep your hands warm and dry on the slopes. Their Storm Trooper II ranks highly in our round-up of ski gloves, and here we include one of their leading casual designs, the Wooly Mitt. The everyday nature of these mittens is immediately given away by its fuzzy berber shell, which is soft and cozy but lacks any real semblance of water resistance or toughness. But for short walks in the cold, the Wooly Mitt is a comfortable choice. 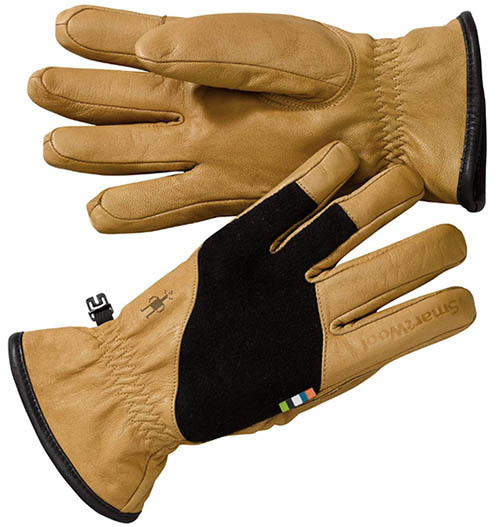 The Gordini’s mitten style makes it quite warm for its price, but it’s not as versatile as a standard glove. If you need to do anything requiring your fingers, you’ll need to remove your hands completely, leaving them vulnerable to frigid air. Further, the mitten has slots inside for each finger—unlike a typical mitten that is open inside—making it difficult to add a glove liner for additional warmth. If you like the berber-style exterior and want more dexterity (at the cost of a little warmth), Gordini also offers a Wooly Glove. What we like: Classic looks and performance. What we don’t: Not long lasting and a bit stiff. Flylow’s Ridge glove is a classic. From lifties and backcountry skiers to emergency use stuffed away under the seat of a car, it has a loyal following that few can match. 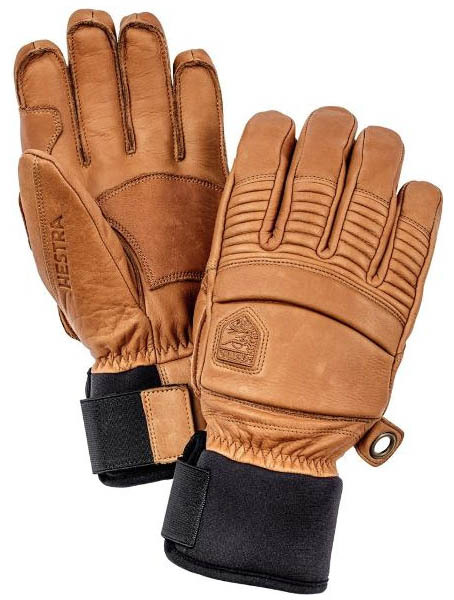 And for good reason: the combination of pigskin leather, elastic cuff, and Sno-Seal waterproofing is comfortable and offers no-nonsense performance. 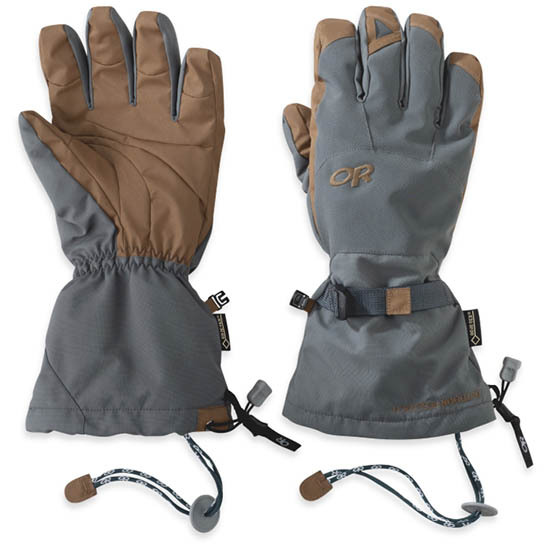 It’s not the warmest leather glove available, but at $50, the Ridge is a better value than options like the 4-Season Give’r or Hestra’s Fall Line above. What pushes the Flylow Ridge down our list—and below the aforementioned Give’r and Hestra—is its build quality and dexterity. The glove is prone to packing out, so it won’t last as long as pricier models, and the generic fit makes it hard to do small tasks like grabbing a phone from a zippered pocket. If you want an even more budget-friendly option from Flylow, check out their Tough Guy, which is less waterproof with canvas along the back of the hand but costs $15 less. What we like: Great running-specific glove that is breathable and weather protective. What we don’t: Might be too thin for some. Under Armour’s Convertible ColdGear Reactor Run is a mouthful to say, but it offers a nice combination of features and warmth for cold-weather runners. This glove breathes well, is water resistant and tech compatible, and is designed with a stash-away “hood” so you can add or subtract the warmth of a mitten depending on conditions (our favorite feature). At $40, it’s a lot to invest in a running-specific glove—you can pick up cheap pairs for less than $10—but the extra protection and versatility that you get from the hood earns it a spot here. Like the SealSkinz Dragon Eye above, the ColdGear Reactor Run is thin enough to only be useful for high-output or shoulder season activities. Due to its windproof and water resistant properties, we like it better for running than a merino or fleece glove. But even with the hood deployed, it’s not going to be warm enough for most people while walking or shoveling snow in the frigid cold. What we like: Nothing beats the warmth of down. What we don’t: We wish the shell was fully waterproof. Down jackets are a staple for cold weather climates, but down gloves are much more of a rarity. Why is this? By nature, down must be lofty to provide warmth, which adds a level of bulk that compromises dexterity. Furthermore, it loses its ability to keep you warm when wet, and nothing is quite as susceptible to getting wet as your hands. But given the right design and environment (think urban use and commuting to work), a pair of down gloves can provide a lot of cozy warmth. Perhaps no brand is better suited to make a down glove than luxury winter apparel company Canada Goose. 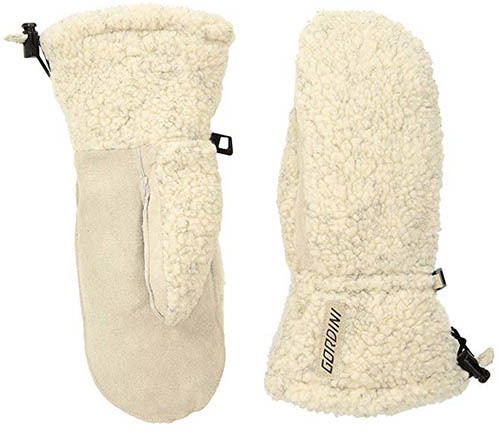 Their Artic Glove is a decidedly casual piece but provides generous warmth from its tough shell and 525-fill goose down. Unfortunately, the nylon exterior is water resistant rather than waterproof, so you need to take care to keep it from absorbing moisture. But for the cold and dry climate of East Coast cities like New York and Boston, the premium build offers an attractive combination of warmth and style. What we like: Fingerless design. What we don’t: Not to be worn in very cold or wet conditions. The glomitt hybrid design is a wintertime favorite. Combining a fingerless glove and a mitten-like cap that slides over the top, you get excellent dexterity as well as the efficient warmth of having your fingers together. Fox River’s Four Layer take on this style is nicely appointed with a fleece lining and detailing like a leather palm and strategically-placed 3M Thinsulate fill. Often sold online for less than its full MSRP of $35, the Glomitt also is a very good value. Keep in mind that the Fox River Glomitt is not made to be pushed past its comfort zone. For one, it has five more openings (one for each finger/thumb) than other gloves, making your hands more vulnerable to getting cold and wet. Furthermore, the knit wool exterior isn’t rugged enough for much more than very light outdoor use. 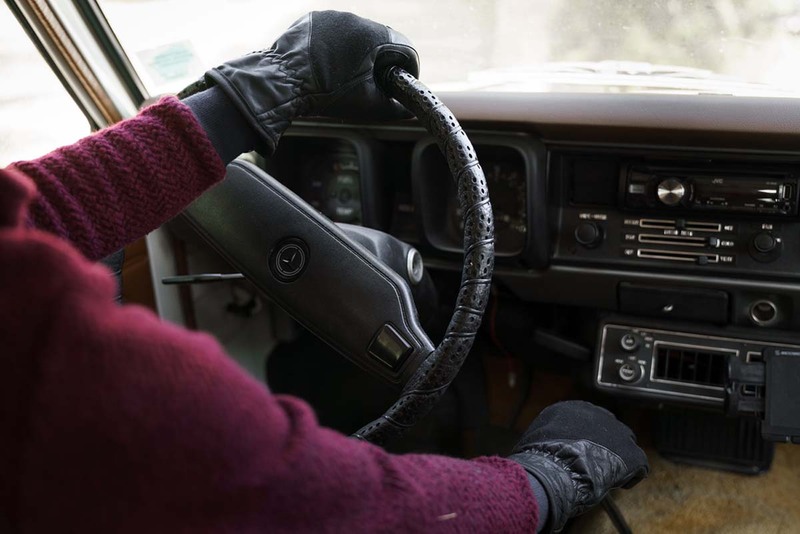 But for casual wear around town and cold-weather driving, we really like this glove. What we like: Durable and inexpensive. What we don’t: Stiff out of the box. 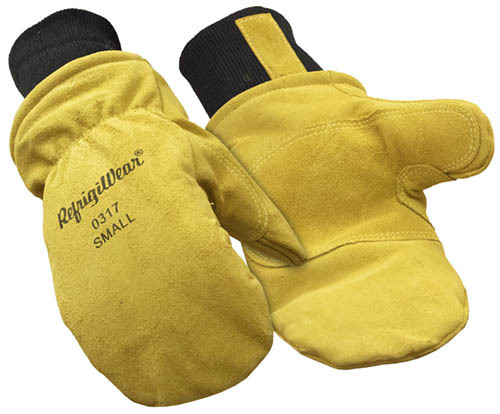 RefrigiWear’s Insulated Leather Mitt combines gardening glove toughness with solid insulation in a mitten layout. The split cowhide leather is reasonably long-lasting, and the company gives it an impressive -20°F rating (although we’d consider that pretty optimistic). The cherry on top? It’s only $18 a pair, giving it the best warmth-to-dollar ratio on our list. We know many folks who swear by this and other RefrigiWear options for outdoor work in deep winter climates. Another option for those who need more dexterity is the Three Finger Split Mitt. With this unique design you get a slight bump in ease of movement at the compromise of less insulation and warmth (and some have complained about the quality of the stitching). In addition, the Three Finger Split Mitt only comes in two sizes, L and XL, which is a notable downside for those with smaller hands. Both are viable budget options for outdoor labor, everyday use, and even winter sports. 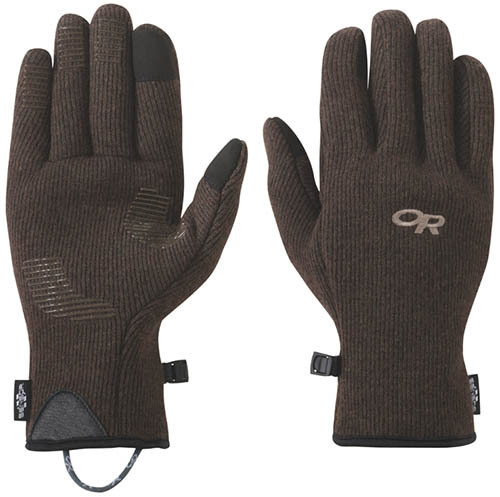 Performance gloves are designed for sustained use in demanding winter conditions. For mountaineering, skiing, or winter bike commuting, these are the top performers. 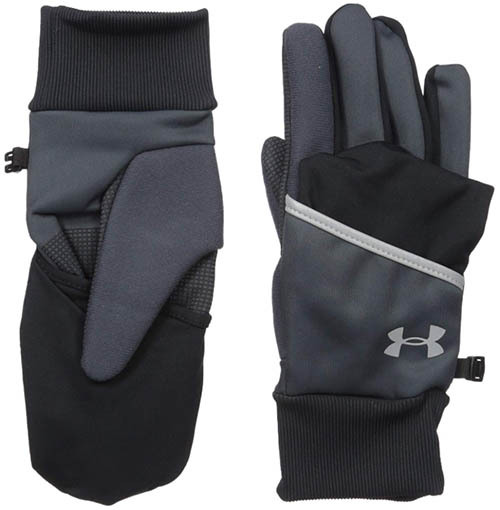 Obviously, a glove made for high-output activities such as cross-country skiing will have vastly different traits than an arctic expedition glove, so this is a wide category. But consistent features include wind and waterproof materials, quality insulation, good dexterity, grippy palms, snug-fitting cuffs, and often expensive price tags. Leading options include the Outdoor Research Alti, 4-Season Give’r, and Black Diamond Midweight Softshell. Casual gloves and mittens are our top picks for day-to-day activities such as walking around town, driving to work, or short winter hikes. Some of these gloves are designed with full functionality in mind—the Fox River Glomitt, for example, gives you complete use of your fingers—while others prioritize styling and warmth (the Gordini Wooly Mitt). All casual gloves are made to keep your hands protected for brief periods of time in the cold, but many won’t stand up well to precipitation. 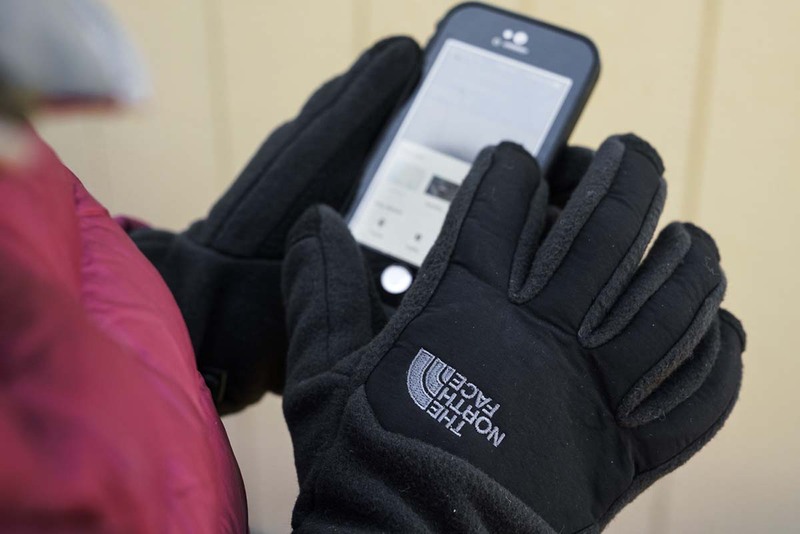 In this category, look for features like touchscreen-compatible fingertips, reinforced palms, the use of wool, and mitten designs. And because they’re not intended for high-end performance, casual gloves are typically among the most affordable. 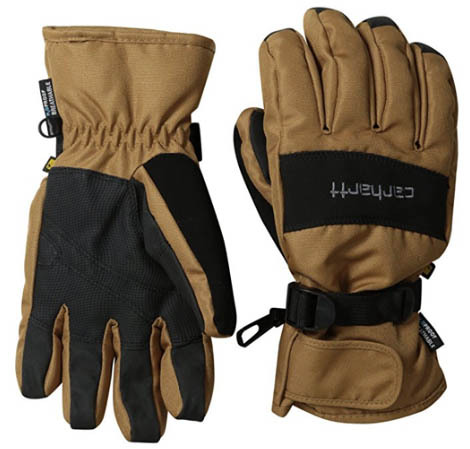 Gloves in our work category put a premium on durability. 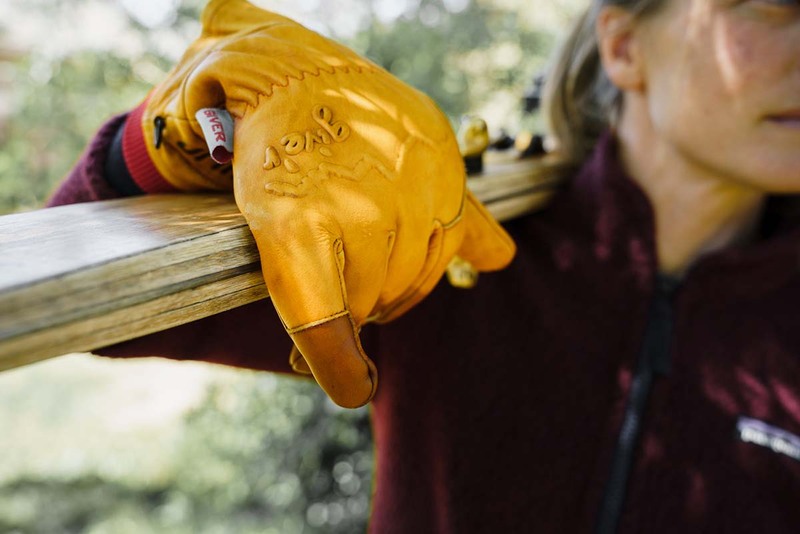 For uses like chopping wood or operating a ski lift, a tough leather glove is hard to beat (it’s no coincidence all our work gloves above are made primarily with leather). Also, look for simple feature sets, dexterous styles, reinforced palms, and short, undercuff designs. Most winter-ready work gloves are fleece-lined or synthetically insulated for added warmth, but you can always double up with a liner (at the cost of some dexterity). In general, work gloves are not made for extreme conditions like true winter sports options, although there are some notable exceptions. The 4-Season Give’r and Flylow Ridge gloves, for example, cross over into the performance category with designs that balance weather protection, durability, and warmth. 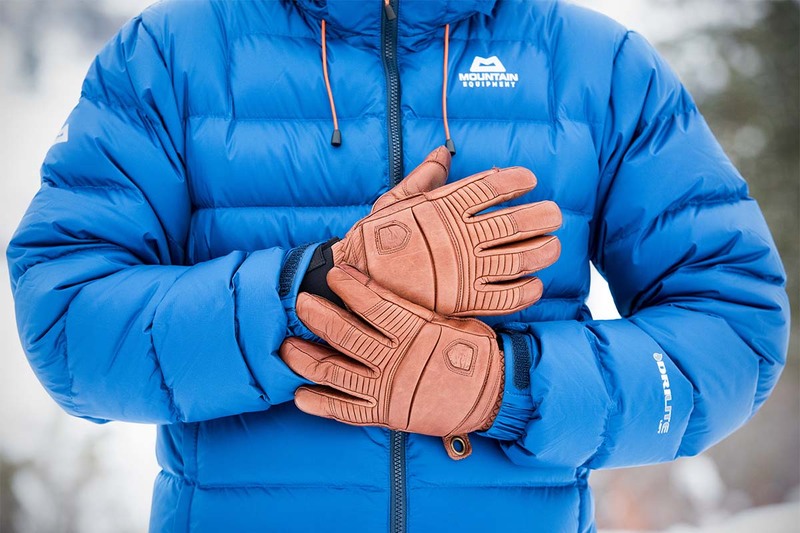 We know many winter enthusiasts who routinely wear models such as these for skiing, snowboarding, or ice climbing rather than gloves specifically made for those activities. But take note: although work gloves often come with a lower price tag, they do not offer the full weather protection of a nylon glove with a long, sealable gauntlet. Warmth is a defining feature of a winter-ready glove, and the amount of insulation provided varies widely between styles. 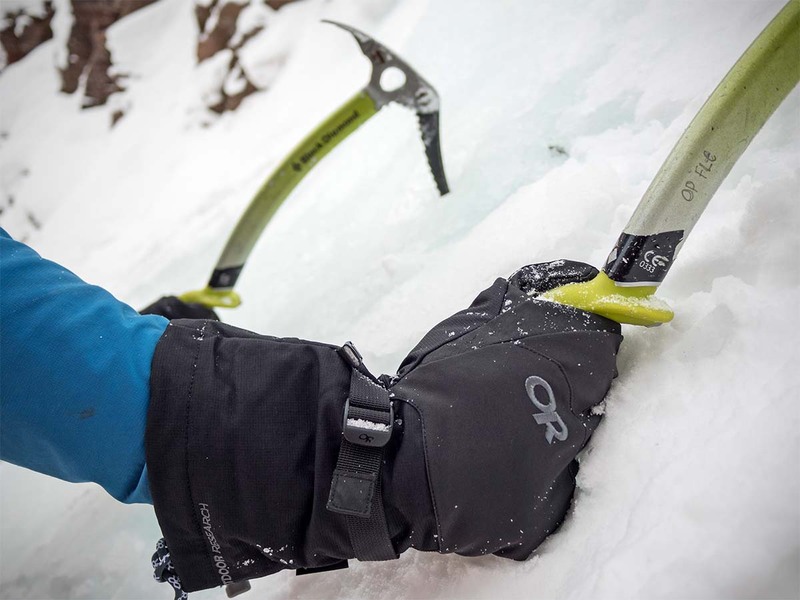 On the very warm end of the spectrum are the Outdoor Research Alti and Black Diamond Mercury Mitt, which have thick synthetic fill, windproof shells, and waterproof inserts for keeping you protected in extreme conditions. On the other end is a lightweight fleece glove like The North Face Denali Etip that is only useful for short stints outside in freezing temperatures. And many designs fall in between, like Hestra’s Fall Line. The premium leather build is dexterous for day-to-day activities, while the moderate level of foam insulation has kept us comfortable on mild-weather ski days and while shoveling snow. The good news is that there is a suitable glove for just about every possible use. Your ideal level of warmth will depend on the expected low temperatures, what activities you’ll be doing, and if you are prone to running hot or cold. 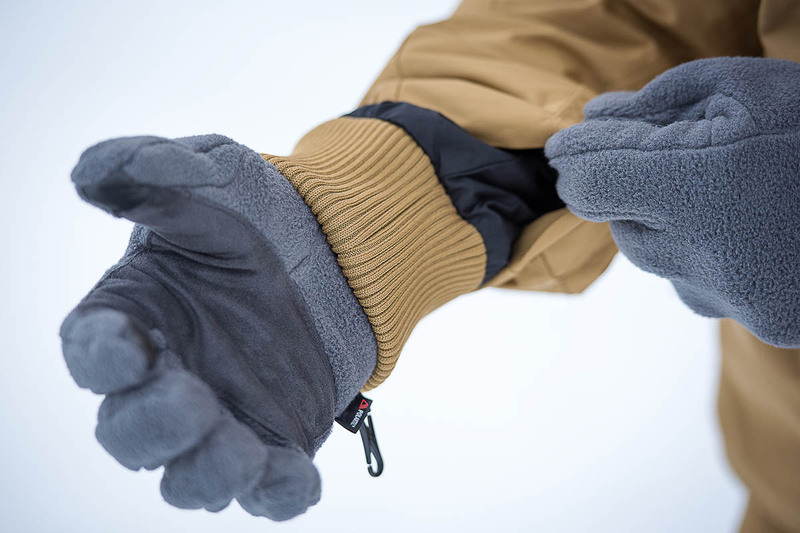 For a seriously warm glove, synthetic fill is our preferred form of insulation. It has all the right properties: synthetic insulates when wet, is an efficient insulator relative to its weight, is reasonably durable and resists packing out, and is cheaper than down. Many of the top performance gloves on our list use this type of fill, including the 4-Season Give’r and Black Diamond Midweight Softshell. It’s worth noting that the quality of the synthetic fibers is important—gloves that use PrimaLoft and Thinsulate are warmer for their weight and longer lasting than cheaper options that uses generic polyester fill. 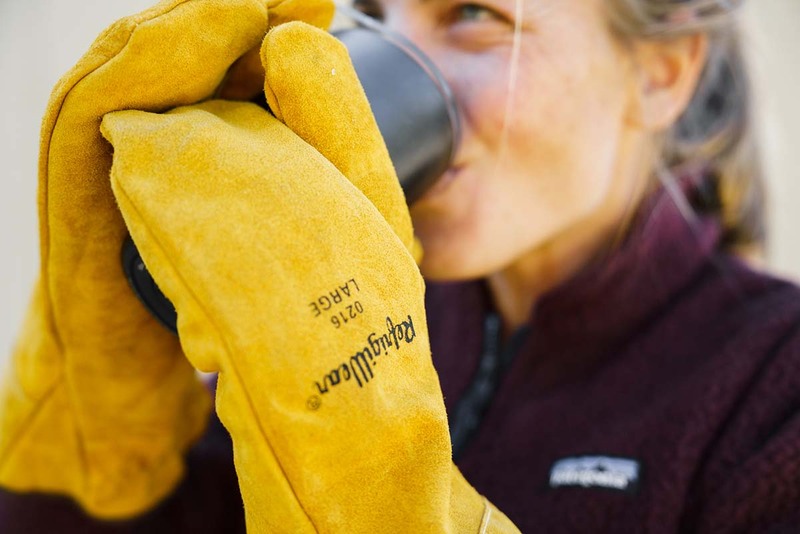 Synthetic gloves may dominate the performance category, but fleece is a popular insulator among casual and lightweight designs. A fleece glove like The North Face Denali Etip is cozy, warm enough for short walks outside, and affordable at $30. Downsides of fleece gloves are that they don’t provide much wind and weather protection (on the other hand, they often breathe well), and aren’t as warm as a synthetic glove. But for a cheap and comfortable option to wear around town, fleece is a good way to go. Wool, and the merino variety in particular, is our favorite material for next-to-skin baselayers and socks, but it isn’t as popular among winter gloves. It’s true that some of the gloves above use wool—the Fox River Four Layer is made primarily of wool, and the L.L. Bean Chopper has a wool lining—but it has its fair share of drawbacks. It generally has a shorter lifespan than fleece, and is heavier, bulkier, and significantly less durable than synthetic. But there’s no denying its warmth—we like wool for a lightweight liner (worn under a shell) or for casual use in dry conditions. Among insulation options, down is the one you’ll see the least. The main reason is that natural goose or duck plumage loses its ability to insulate when wet. You can mitigate this issue with a burly, waterproof shell, but even the sweat from your hands can compromise the down fill. As such, you’ll run across the occasional casual down piece like the Canada Goose Artic above, but synthetic gloves are far more practical (and affordable) for wet and snowy conditions. Many winter gloves are not fully waterproof, but those that are fall into two basic styles: an outer shell that blocks out moisture, or a waterproof membrane sandwiched between the shell and liner. Starting with the waterproof shell design, these gloves are typically made with leather, which resists wind but is naturally prone to absorbing moisture. As such, they require a treatment of Sno-Seal or equivalent product to create a water-blocking barrier. It’s important to note that these gloves also need routine maintenance (washing or reapplication of treatment) to stay in working order (more on this below). A waterproof shell does the trick in dry snow or if you stay on top of the maintenance, but it can’t compete in terms of all-out water resistance with an internal membrane. The highest quality waterproof layer on the market is Gore-Tex, known for its combination of long-lasting moisture resistance and breathability. Most high-level gloves are made with Gore-Tex, while more budget-oriented gloves feature various off-brand designs, such as BDry, C-Zone, MemBrain, etc. You can expect varying levels of performance from these fabrics, but in general, a lower price point will mean compromised waterproofing, breathability, or both. Again, cheaper gloves will be fine for most purposes—including mild-weather resort skiing and outdoor work—but if you really want a glove to hold up in wet and miserable conditions, expect to pay a bit more. For casual use or if you’re not outside for extended periods of time, a non-waterproof glove often will be sufficient. Fleece and wool models offer the least amount of protection, while some, like the leather Hestra Fall Line, are highly wind and water resistant. In general, we recommend a waterproof glove if you’ll be out in the elements for long stretches and will run the risk of wet hands. But more air-permeable designs are a fine choice for wearing around town, while shoveling snow, or even on the occasional snowshoe adventure. As we touched on in the waterproofing section above, leather gloves require occasional treatment to avoid absorbing moisture. Some models come pre-treated, including Flylow’s Ridge glove, while others like the RefrigiWear Insulated Mitt are just plain leather. The most common and effective coating is Sno-Seal. 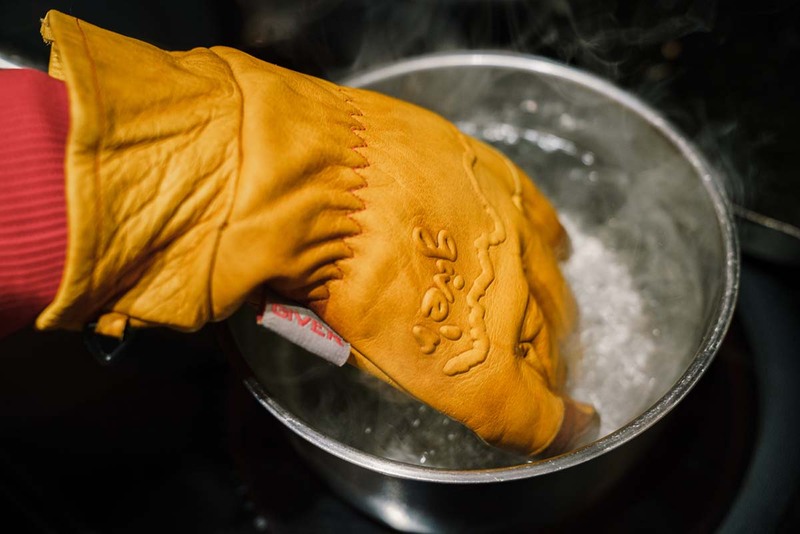 This beeswax-based solution requires a fair amount of effort—including baking the glove in the oven—but it’s a proven formula that’s extremely popular among skiers in wet climates. Simpler and less-involved options that still provide a good level of protection include Nikwax’s Waterproofing Wax and Hestra’s Leather Balm, which can be applied quickly by rubbing in the treatment with a cloth and drying overnight. Depending on how often you wear your gloves and in what kind of conditions, you may need to re-treat the leather one or more times a winter (it’ll be clear when you need to reapply because the gloves will stop shedding moisture). Durability should not be overlooked when it comes to choosing the right glove. After all, what gets more use than our hands? 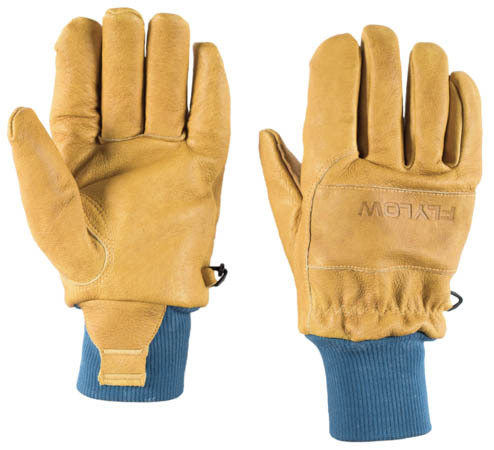 The most long-lasting gloves fall into the work category and are made of ultra-tough leather. An additional waterproofing treatment—such as Nikwax, Sno-Seal, or similar product—provides a barrier from moisture but also serves to extend the glove’s lifespan. Nylon shells are another long-lasting option, particularly well-made performance designs like the Outdoor Research Alti. Simple wool and fleece models are the most prone to developing holes and tears and should be limited to casual activities. It’s worth noting that some nylon, wool, and fleece gloves are reinforced with leather in high-use areas (such as the palms and fingertips). For many wintertime uses, from putting chains on your car in a snowstorm to texting on your smartphone, it’s important to have a pair of highly dexterous gloves. And if this is a priority for you, the supple and stretchy nature of leather (even lined leather) makes it a popular choice. Another factor is the level of insulation: in general, thinner and less warm gloves are more dexterous. Finally, the construction plays a role—Hestra’s Fall Line has external seams along the fingers that make it surprisingly easy to perform fine motor movements despite the glove’s warm foam insulation. Keep in mind that dexterity doesn’t need to be the top consideration for everyone—thick or bulky gloves can still be useful in many situations, including shoveling snow, skiing, or just walking in extreme cold. 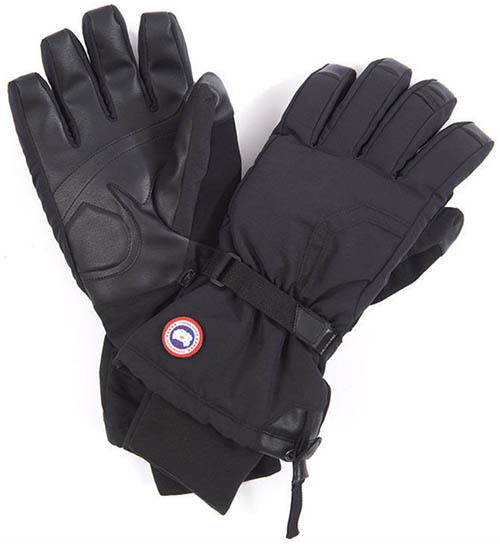 Gauntlet gloves extend over the cuff of a jacket (rather than under), providing excellent weather protection and warmth. When done right, it effectively seals out cold air and virtually eliminates the possibility for snow to enter. Gauntlet gloves are easy to get on and off, with large openings and one-handed drawcords that tighten and release. They are often heavier, bulkier, less agile, and less ventilated than other styles, but worth it if you really want to batten down the hatches. We like the gauntlet style best as high-performance gloves for winter sports and expeditions. Undercuff gloves—usually incorporating a cuff made with stretchy wool or synthetic material—sit under the winter jacket and hold the glove close to the wrist. The cuff provides both a barrier from the elements and keeps the glove from slipping off the hand. While an undercuff glove is less bulky, lighter weight, and better at ventilating than a gauntlet style, it can’t compete in terms of weather protection. Even if you tighten your jacket sleeves snugly over the top, there’s a chance your sleeves will ride up during activity. But for outdoor work or everyday use, the simplicity of an undercuff design is very appealing. Many gloves come with either a built-in or removable liner (the latter often are referred to as 3-in-1 gloves). Made from synthetic or wool, a liner wicks moisture away from the skin and adds an element of warmth, even when wet. A liner that can separate from the glove provides added versatility—you can wear the liner or shell separately, or combine them for maximum warmth. Furthermore, separating the layers allows for faster drying and the ability to swap liners in the middle of a particularly wet day. 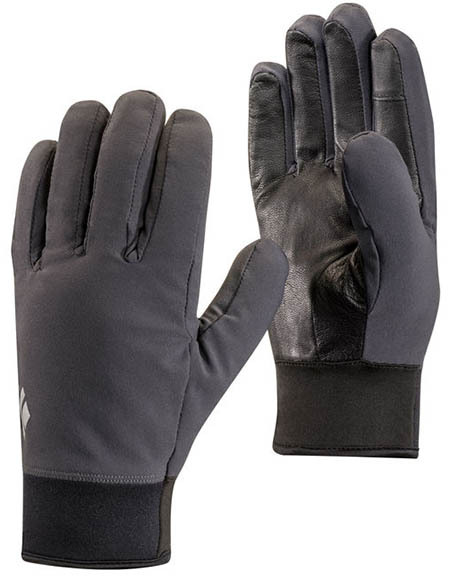 3-in-1 gloves are bulkier, heavier, and less dexterous, but certainly have their merits. And keep in mind that even if a glove is not sold with a liner, you can always layer it with a thinner set for added warmth. We’re on our phones more now than ever, and in 2018 we see this reflected in glove design. Over half of the gloves on this list feature touchscreen-compatible pointer fingers and thumbs, and the number of available designs are increasing each year. In short, the technology uses conductive fabrics in the fingertips so that your body’s electric current—what the screen must recognize to be responsive—is transferred through the glove (interestingly, you can make this modification yourself with a simple needle and conductive thread). As expected, thin gloves work better on a touchscreen than thick gloves (a simple matter of accuracy). 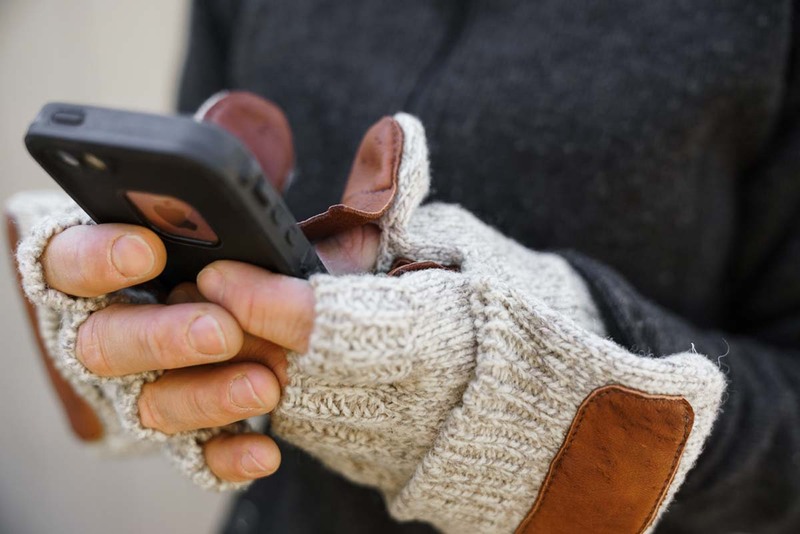 This makes a glove with a touchscreen-compatible removable liner appealing: you get the warmth of a heavy winter glove but the ability to use your phone without fully exposing your hand to the elements. Winter gloves can range from simple leather designs like the L.L. Bean Buckskin Choppers, to fully featured models with wrist cinches, nose wipes, zippered pockets, and carabiner loops for carrying on a harness. These features generally increase with performance—everyday and work gloves are usually the simplest (sometimes with touchscreen compatibility as the only noteworthy addition), whereas winter sports gloves often include all the bells and whistles. Some gloves even come with a battery-powered heat pack for particularly cold environments—or particularly cold hands (the Outdoor Research Capstone Heated Gloves being one of our favorites). 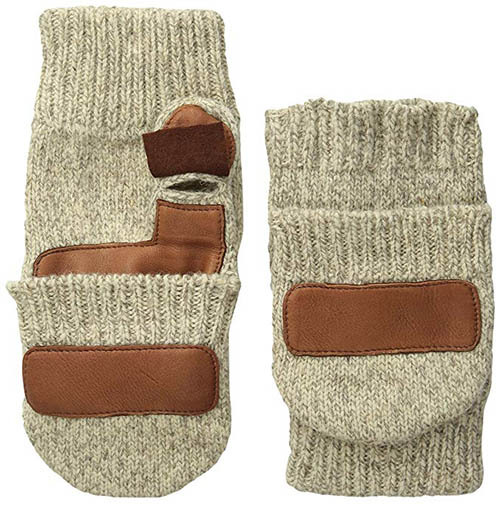 For the chilliest of conditions or those that suffer from habitually cold hands, mittens are a great choice. By keeping your fingers together rather than isolating them as gloves do, mittens offer a notable increase in protection and warmth. The largest downside of mittens is the lack of dexterity. Even for simple tasks like tying your shoes, unzipping your pockets, or grabbing a small item, mittens are bound to make you feel clumsy. Depending on the activity, you may end up removing them enough times that your hands would have stayed warmer with gloves on. But for the occasions when you don’t need nimble hands, nothing beats the warmth of mittens. Some gloves—like the Fox River Glomitt or the Under Armour Convertible—are designed with mitten flaps that extend over the top of gloved fingers. For casual use, this can be a best-of-both-worlds scenario—convenience, dexterity, and warmth all in one. But take note that the partial flap will not suffice to keep your hands dry in snow or rain. A third option for mittens is the 3-finger design, which is also known as the split finger or lobster glove. Here, the thumb and pointer finger have their own slots while the other three fingers remain together as in a mitten. We don’t love this style in most cases—dexterity still is largely compromised and the increase in warmth is minimal.